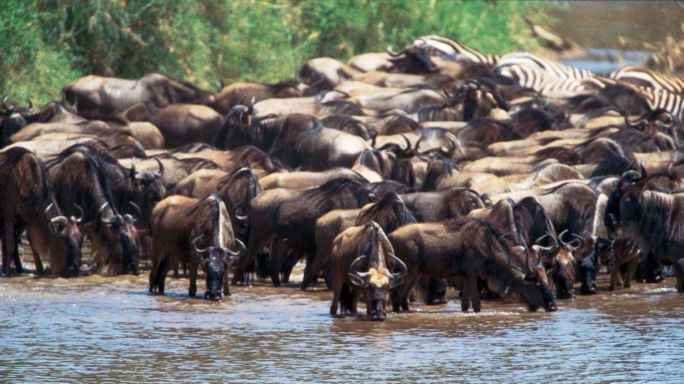 Migrations are mass movements from an unfavorable to a favorable locality and in plains-dwelling, large herbivores such as reindeer, bison, zebras, wildebeest, or elk they can be quite spectacular. 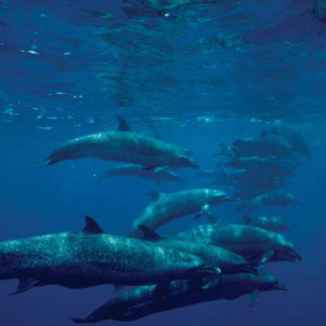 In large sea mammals migrations are no less important, but to us are merely less visible and it has taken much effort by science to document at least a part of their extent, leaving much that is still shrouded in mystery. Mass-migrations occur when individuals flood to distant birthing or breeding grounds, to seasonal food sources, or to escape winter storms. Close associations of large numbers of individuals during migration is merely a security measure, capturing the great advantages of the "selfish herd" against predation. 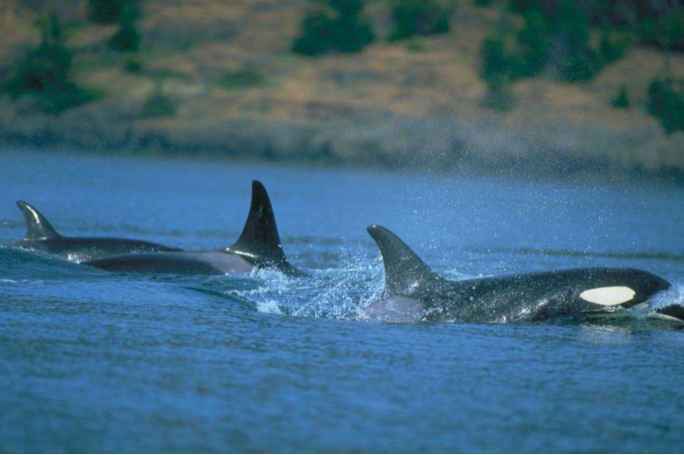 Long distance movements are also undertaken by individuals or by small groups, particularly in the oceans. the crusted snow surfaces during the night. During the day "sun crusts" may soften, trapping all travelers temporarily in deep snow. at low elevation and that this sprouting creeps upward as spring progresses. Herbivores follow this line of sprouting vegetation because sprouting vegetation it is the most nutritious and most easily digested forage there is. Consequently, there are movements by all sort of large herbivores from the valley to the mountain tops in spring and summer. Less dramatic, but equally important are the movements of herbivores in response to flooding in river valleys and the withdrawal of the flood because the areas just flooded have been fertilized with silt, and rich plant growth follows the withdrawal of water. sonal ranges for mountain sheep may be tens of miles (kilometers) apart. Megaherbivores such as elephants, rhinos, and giraffes may move over huge annual home ranges between small dry season ranges close to water and large wet season ranges. The size of these ranges may be hundreds of square miles (kilometers). Areas within are used opportunistically depending on forage and water availability. The ability to move rapidly over long distances, coupled with excellent memory of locations, allows elephants to live in vast desert areas. While the wet season areas are large, travel may be restricted at that time by the abundance of food. Movement may be more extensive in the dry seasons due to decreased forage density. Food availability also dictates mass movements of African plains animals such as zebras, wildebeest, and gazelles in the Serengeti plains. The great productivity of the plains during the wet season attracts them, and they leave the woodlands they use during the dry season. Zebras, wildebeest, and gazelles form a grazing succession in which the zebras first remove the coarse grasses. The re-growth of grasses then creates good foraging conditions for wildebeest, which in turn graze down the grass exposing dicotyledonous plants that attract gazelles. The variations in timing of the rainy seasons thus affect the mass-movements of these herbivores to and from the woodlands. runner. Selfish herds are thus dangerous places for slow runners, be they ill or merely heavily pregnant. However, for a healthy individual of average abilities, joining with others and staying close together is an excellent way to minimize the risk of being caught by predators. 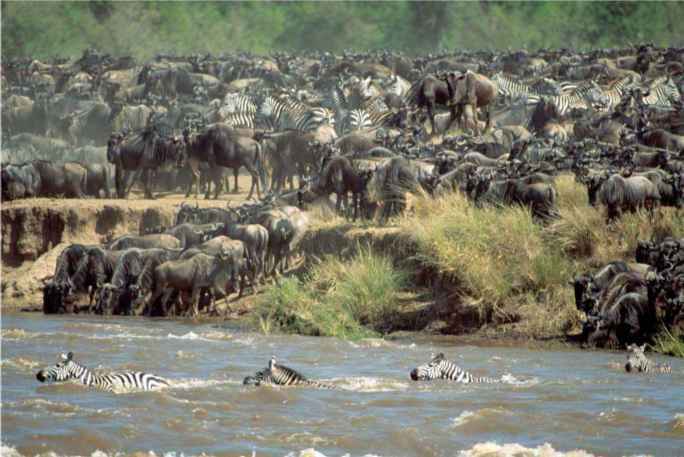 As a consequence, uniting into huge herds is a possibility in large expanses of open landscape. However, the very gathering into a huge mass raises severe problems in food acquisition. A large mass of herbivores will quickly deplete the available forage and must move on. That is, huge herds must move just to stay fed and it matters little where they go as long as they stay with food. This leads, of course, to unpredictable movements, which incidentally reduces predation risk still further as it does not permit predators to anticipate the direction or time of movements. This random movement, excepting predictable occupation of grasslands freed of snow in winter by warm katapatic winds along mountain fronts, or of grasslands recovering from large wildfires, was suggested to be the model of bison migration in North America up to the late nineteenth century. That is, food availability governed the mass-movements of the bison herds over the huge expanse of prairie in the center of the continent. 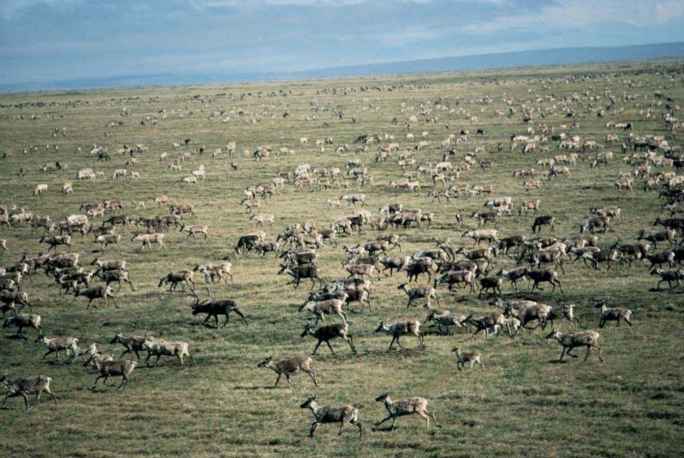 The mass migrations of reindeer in Eurasia and barren ground or Labrador caribou in North America have as their primary focus the calving ranges in spring. 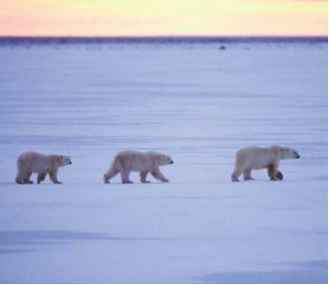 Pregnant females lead this migration, which is closely focused in both space and time. This is the most predictable migration and it leads to barren, snowed-over areas with a minimum of predators. These large, dense herds also reduce predation by "swamping" existing predators with a great surplus of calves on the calving grounds. Reindeer bulls lag behind in the migration. 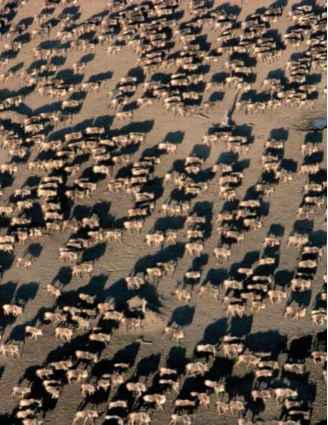 From the calving grounds the herds move predictably to summer ranges with high productivity and some protection from insects, which in large numbers can debilitate caribou. Males and females mix on the summer ranges. From the summer feeding grounds the herds drift towards the wintering areas below the timberline. They mate during a short rutting season while traveling to the winter ranges. Caribou can travel with remarkable speed and shift location within any seasonal range. Nevertheless, their movements are predictable as they follow the same landscape features including favorite locations above waterfalls and rapids on large rivers. These and large lakes are no serious barrier to caribou, which are excellent swimmers. Caribou may travel over 3,100 mi (5,000 km) in their annual migrations. every unit of fat stored, as much as another unit is lost as metabolic heat—evolved in response to both seasonality of climates and high diversity of habitats within any one season. Extremes in seasonality as well as in terrestrial and marine habitats developed during the major glaciations of the Ice Ages during the Pleistocene. Some extreme examples of fattening and long distance migrations were evolved by baleen whales. For instance, in the short Antarctic summer such whales congregate about the Antarctic pack ice encircling the Antarctic continent, particularly in regions where the cold waters rich in dissolved oxygen and carbon dioxide are fertilized by mineral-rich, warm deep-current upwellings to produce explosive plankton growth. Whales feed gluttonously on this superabundant food, mainly on krill, which consist of small crustaceans, and lay down massive fat deposits. Some whales reach about 40% body fat at the end of summer. 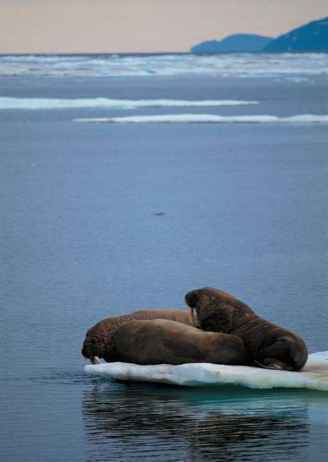 As the Antarctic summer turns to winter the pack ice extends outward from the continent, cutting off whales from their feeding grounds. The whales depart for warm waters thousands of miles (kilometers) away where the pregnant females give birth to their young and maintain lactation while usually fasting until the following summer. These whales thus live by a "boom and bust" economy and their huge size and reduced metabolism per unit mass allow them to exist without feeding through the greater part of the year. Similar patterns of seasonal feeding and dispersal are followed by whales in the Northern and Southern Hemispheres except that the plankton food supply in the Antarctic appears to be richer on average and whales reach there larger sizes. 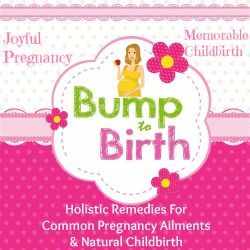 Clearly, being able to fast during the reproductive periods allows whales to choose areas of increased security for their newborn and growing offspring. The phenomenon of gigantic migratory whales is predicted on the existence of polar mineral-enriched waters near the freezing point that, unlike tropical mineral-poor waters, are superlative producers of phyto and of zooplankton, as well as on the existence of fast-freezing polar ice shelves that after summer exclude the gluttonous behemoths. Terrestrial migration has not been for small-bodied creatures, the myth of northern lemming migrations not withstanding. Small-bodied mammals tend to deal with seasonality by growing fat in summer and hibernating during the winter, as do some northern carnivores such as bears and badgers. Hibernating is a withdrawal in time from severe climatic and foraging conditions; migration is a withdrawal in space. Thus these are both adaptations that deal with the severity of seasonal winter climates. nia. To exploit such migratory species, however, requires either following them continuously—an unlikely prospect—or developing a way to regularly intercept their migrations, killing in excess of need, and finding means to store the surplus for the future. Intercepting migratory species cannot be done with out understanding chronologic time. Migrants tend to reappear in the same localities much at the same calendar time, particularly if migration is closely tied to reproduction. Reproduction is timed in some of the migrants by the annual light regime which, via stimuli through the optic nerve to the hypothalamus, regulates the hormonal orchestration of reproduction. The variation in annual reproduction tends to be narrowly confined about specific calendar dates, and so are the migratory movements associated with reproduction. The same individuals reappear in the same locality within a few days of the same calendar date each year. 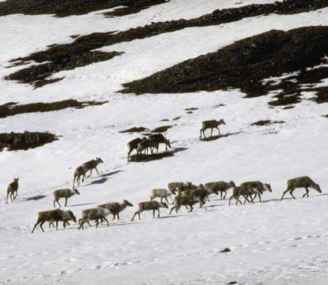 There is some evidence to suggest that Upper Paleolithic people in Eurasia discovered chronologic time and used it to predict and exploit migratory reindeer. They marked what appear to be lunar calendars on tines cut from reindeer antlers. That would have enabled them to anticipate reindeer migrations, move to localities where reindeer were vulnerable, and prepare for the kill. Reindeer bones comprise over 90% of the bones from Upper Paleolithic archeological sites. There is evidence for large flint-blade processing sites. Long, very sharp flint blades were struck skillfully from large flint cores. These long, thin flint flakes are ideal knives for the many hands needed to carve up reindeer meat for drying. Wood ash, ideal for smoking and drying meat, predominates in Upper Paleolithic hearths. The pattern of bone fragments indicates that de-boning of reindeer carcasses was done away from processing sites, so that meat was brought in for processing with just the bones required to hold the meat together or those used for marrow fat or tools. The superlative physical development of these large-brained cave-painters indicates that they enjoyed abundant food of the highest quality. Caribou meat has balanced amino acids for humans and caribou fat has an optimum essential fatty acid balance for brain growth. Caribou are valued highly as food by indigenous people and Arctic travelers and their fur is unsurpassed as a material for clothing and shelters in Arctic climates. Eventually salmon replaced some of the reindeer in the Upper Paleolithic, but salmon runs are also chronologically timed and can be predicted by calendar dates. To exploit a reindeer or salmon run it is crucial to be at the right place in the right time. And the same applies to migrations of bowhead whales along the coast, an important traditional food source for northern coastal people. Without an idea of chronologic time and how to keep track of it, no large-bodied mammalian migrants could be hunted systematically. With the discovery of chronologic time, however, these very rich, predictable, high-quality food sources became available for exploitation, leading to the spread and dominance of modern humans from the late Pleistocene onward. How do Bison mammals illustrate selfish herd selection?